MIDTOWN — The number of women-owned businesses went up 43 percent over the past decade, including a meteoric 77 percent jump in Brooklyn, according to a study. But their male-owned counterparts still outpace them in everything from revenue to number of employees, officials said. The increases were highlighted in the preliminary results of a study from the city's Department of Small Business Services during the Thursday launch of Women Entrepreneurs NYC, a program meant to connect 5,000 women entrepreneurs with the skills, services and connections they need to grow their businesses. "WE NYC was born out of a belief on our end that women entrepreneurs are key economic actors," said SBS Commissioner Maria Torres-Springer. "As one woman's business flourishes so does her family, the community and the economy." The study is still examining the reasons for the jump in women entrepreneurs but experts said the recession may have pushed more women to launch on their own to supplement family income because of the loss of a job, for example. According to the study, there are approximately 359,000 women-owned businesses in the five boroughs, making up 32 percent of the total. Over the last decade, that number has grown by 43 percent, outpacing the 25 percent growth of male-owned enterprises and the 39 percent combined growth of all businesses. Growth in Brooklyn was the fastest with a 77 percent increase over that time period, making it home to the most women-owned businesses of any borough at 30.5 percent, city data shows. Staten Island had just 3.4 percent women-owned businesses by comparison. Brooklyn's increase was followed by Queens' 64 percent growth during the decade. The other boroughs saw increases of less than 40 percent. But businesses owned by men still have a distinct advantage, the study found. Men own 1.5 times the number of businesses that women do, generate 4.5 times more revenue and employ 3.5 times more people, according to the study. Women are also under-represented in areas with the greatest financial potential such as manufacturing and finance and are concentrated instead in sectors like social services which tend to generate less revenue. According to the report, access to capital, discrimination, education and training are some of the barriers women face when trying to launch or sustain their businesses. Women Entrepreneurs NYC aims to link women with already existing services from the city's Department of Small Business Services while also offering a chance to partner with firms such as Goldman Sachs and micro-lender Grameen America to grow their business. It also will offer one-on-one mentoring, loan negotiation workshops and basic business skills courses. Goldman Sachs' 10,000 Small Businesses initiative will offer access to capital and business support services. LaGuardia Community College will hold classes designed specifically for women entrepreneurs. “For far too long, the odds have been stacked against women who want to start their own business,” first lady Chirlane McCray said. Sherri Royes, a Coney Island resident and the owner of Chef Sherri's Catering, said business training is incredibly helpful in her own ventures. 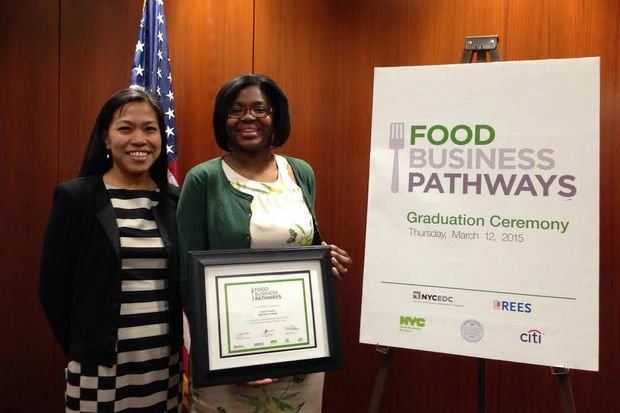 WE NYC was unveiled at her graduation from the Food Business Pathways program, which organizers hope to emulate going forward. After taking her first culinary class four years ago, Royes knew what she wanted to do for a living but not necessarily how. "When I wanted to start a catering business I knew how to cook but there are some things you don't understand," Royes said, citing cost control and pricing as examples. She hopes WE NYC will help other women gain some of the knowledge that she now has. "I know other women that have ideas to start businesses," she said. "This gives you a chance." The city wants women entrepreneurs to take a survey to help them gather more data. "We want to hear what their needs are," said Torres-Springer. "We want to talk to women business owners themselves."